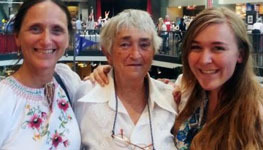 Polish Festival at the Seattle Center has the new Director, as Alisa Lidzbarski Lahti agreed to take over the leadership of the most important Polish event in Seattle. Ms. Lahti is an artist and a well-known member of the Polish community where she has been actively involved in different roles since her childhood, most recently helping to run the Festival. Her professional background in the software industry includes many years of experience in marketing and event management. Congratulations and good luck! The Polish community is grateful to the outgoing Producing Artistic Director Danuta Moc, who has run the Festival for the first three years and secured for it a permanent position in the Festal lineup of ethnic festivals at the Seattle Center, and to Managing Director Teresa Davis, who has been a co-creator of the Festival from the beginning and was instrumental to its success in 2014. Thank you, ladies! Ms. Teresa Indelak Davis, a very well-known and respected member of the Polish community, has become the Honorary Consul of the Republic of Poland in Seattle. 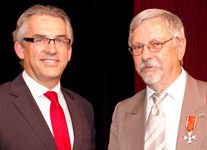 The inauguration ceremony at the Polish Cultural Center Dom Polski on September 4, 2014 with Polish Consul General Mariusz Brymora and consuls from other countries appointed to Seattle also marked the official opening of the Honorary Consulate of the Republic of Poland in Seattle. Congratulations! The role of the Honorary Consul is to assist the Polish Consulate in Los Angeles in promoting exchange and relations between the State of Washington and Poland, facilitating official delegation visits from Poland, promoting tourism and providing basic consular services to Polish citizens who are visiting or residing in our state. The jurisdiction of the new consulate covers the entire State of Washington. The 22nd Annual Seattle Polish Film Festival is looking for independent film submissions for the festival in October. The deadline to submit is September 30th. There is no entry fee to submit your film with some sort of Polish connection and all lengths are welcome. To learn more, please visit SPFF submission page. Prizes will be awarded in several categories! On the left you can admire the 2014 SPFF poster - congratulations to Celeste Caliri who has won this year's SPFF poster competition! Also: Volunteers needed to run the Festival. SPFF runs Oct 10-19 this year at SIFF Cinema Uptown. The Huffington Post published a long article with several photographs by Alena Hall based on the family story of Mrs. Krystyna Balut. Mrs. Balut is a survivor of the massive deportations of Polish citizens to the Soviet gulag camps during WWII. She has been tireless in spreading the stories of this terrible experiences through A Trip To Nowhere film and book based on old family documents and interviews with several survivors from the Seattle area. Congratulations to Mrs. Balut and her greatest supporter in this endeavor, daughter Grazyna Ostrom! More: read the full article at the Huffington Post site. Buy and watch the animated film, visit Trip to Nowhere site. At the Seattle Polish Festival in July, Polish Consul General Mariusz Brymora decorated Mr. Zbigniew Pietrzyk with a Cavalier Cross of the Order of Polonia Restituta in recognition of his Solidarity activities in 1980-82. Mr. Pietrzyk was the Solidarity leader at the Miflex plant in Kutno, Poland. Arrested during the Martial Law period he spent a year in prison and then was allowed to leave Poland. He arrived in Seattle in 1983 and was a co-founder and the president of the Solidarity Association till 1990. He has been an active member of the Polish community and currently serves as the Director of the Seattle Polish Film Festival. The Order of Polonia Restituta is awarded by the President of Poland. Congratulations! The Kosciuszko Foundation is accepting applications for special tuition scholarships ($2,000 each) for undergraduate students of Polish descent. Students seeking careers in media, government, and public affairs are particularly encouraged to apply. Deadline is July 31, 2014. Also, Applications for a number of Fellowships/Grants to Poles for advanced study, research, and/or teaching at universities or other institutions of higher learning in the USA for the 2015-16 academic year are being accepted through October 15, 2014. More: Scholarship info, Exchange scholarship info. Polish Festival at the Seattle Center Needs Volunteers! Polish Festival at the Seattle Center is looking for volunteers! Whether you are you greeting the public, serving food or assisting with Polish arts or crafts, YOU are the essential part of this festival! Join us on July 12 and be part of the action! Volunteers like YOU make the festival happen! The Festival is still looking to fill several volunteer positions with 2hr - 4hr shifts, such as: Greeter, Beer Garden Helper, Armory Set-up Assistant, Information Booth Assistant, Potato Pancakes Booth Helper, Children Activities Assistant, Workshop Assistant, Stage Assistant, Flex Volunteer. More info about volunteer opportunities here. The Consulate General of the Republic of Poland in Los Angeles kindly informs that the consular visit to Portland to process passport applications only is scheduled for September 25, 2014. The Consul is available from 9 am to 5 pm and reservations are required. The reservation system has changed - to make a reservation send an email to losangeles.kg.paszporty@msz.gov.pl stating your name, DOB, the PESEL number and a preferred time. 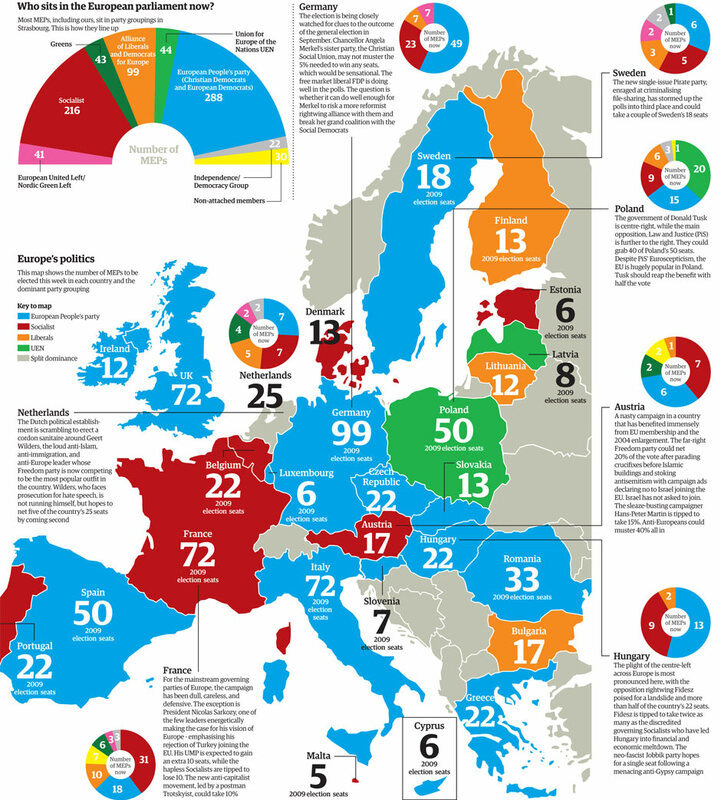 Polish citizens abroad, as well as EU citizens permanently residing in Poland, can vote in the European Parliament elections on May 24, 2014 at the polling stations organized by the Polish consulates. The voting may be in person or by mail. There will be no polling station in Seattle. In the consular region of the Consulate General of Poland in Los Angeles, which covers western United States including state of Washington, there will be one polling station at the Consulate in Los Angeles. To vote by mail, you need to register by 4:15 pm PST on May 12, 2014. For voting in person the registration deadline is May 22. There are several ways to register, the easiest should be by the internet at https://ewybory.msz.gov.pl/. More: Official Election Communiqué #2 (PL). Election info, candidates etc. at http://ewybory.eu/ (PL). All Polish citizens abroad vote on the Warsaw I list. The Polish Choir Vivat Musica! has a new artistic director, Mr. Scott Fikse. Mr. Fikse graduated from the Pacific Lutheran University in Tacoma and is the Director of Music at the Findlay Street Christian Church in Seattle. He is a musician, voice coach, pianist, music arranger and a buff of barbershop (a capella) music. Congratulations and good luck! More: The Polish Choir is always on the lookout for new voices. If interested, please contact the Choir manager, Barbara Niesulowski. On May 6, The Seattle Foundation hosts the annual GiveBIG event – a one-day, online charitable giving event to benefit local nonprofits such as the Polish Home Foundation (PHF). The reason this is important to us is that it is a matching event that can bring additional funds to our community. Please support PHF through GiveBIG - every donation to PHF made via Seattle Foundation PHF Profile Page on May 6 will bring additional money thanks to the Seattle Foundation and GiveBIG sponsors, who will stretch your donation by matching a share of every contribution! Win a plateful of pierogi! It's this time of the year again: Seattle Polish Film Festival is having another poster competition for the upcoming 22nd edition of the Festival. Deadline for entries is 11:59 pm on June 29, 2014. The poster will also be used on the program cover. Please visit Seattle PFF site for competition rules, poster requirements and award details. Where: At the Polish Cultural Center Dom Polski in Seattle; reservations required - please read one of the documents mentioned above. Ms. Magdalena Hill, a local artist, performer, animator and video producer is making her first movie. She is the director & screenwriter of an art film inspired by a short story by Robert Kroetsch. Presented in the magic realism genre, it follows a mythical idea of a swarm of bees making love to a young gardener. The film is shot but needs to go to the post-production, involving 3D animation, green screen compositing, editing and an original sound track. To support this final stage please visit Movie info & campaign site. Your contributions will be highly appreciated! The Polish School in Seattle has a new principal. Ms. Maria Grabowska has taken over from Mr. Michael Cozzie who has managed the school for the last two years and resigned due to demands of his daytime job. Ms. Grabowska is a very active member of the Polish community, known mostly from her role as the musician accompanying the Polish Choir, but she has also been a longtime teacher at the Polish School. Congratulations and good luck! The Polish School starts a new preschool Saturday class. Also, the school accepts children and adults all the time to the existing classes. Please contact Ms. Grabowska at 425-271-3669 if interested. Amazon has a new program called AmazonSmile that donates 0.5% of the eligible purchase price to your favorite charity. Any 501(c)(3) charity on the official IRS list is eligible for the program once registered with Amazon. You can use your regular Amazon account for related purchases but need to start shopping through http://smile.amazon.com. The Sybiracy Project launched a new campaign to spread the story about Polish WWII civilians exiled to the Soviet Gulag camps. The goal of the campaign is to place both the movie A Trip to Nowhere and its companion graphic book at schools and libraries nationwide. A group of 80-year-old survivors currently living in Seattle Washington, became film makers and created an animated documentary (DVD) and companion graphic novel sharing their stories of Soviet genocide of Poles during WWII. Please help to distribute the campaign flyer. Please read more .. Please share this crowd funding campaign link and encourage people to donate $5, $10 or more to this not-for-profit cause. Any amount helps us get closer to our goal. The Polish Library at the Polish Home has opened for the new season with hundreds of new books, especially children books. Polish Home library has received two book collections recently, including over hundred of classical and modern beautifully illustrated children books as well as books from the Polish Book Club list. The children books are the popular fairy tales and stories children in Poland read and grow up with. Several of the books are for the youngest readers introducing them to the Polish language words. Big thanks to our donors! Everyone especially parents and children are invited to visit and check out a book. As an alternative a quiet room is also available to read a book at the library. More: biblioteka-dompolski.blogspot.com, or contact Monika at MonikaJohnson@yahoo.com. The 21st Seattle Polish Film Festival is the second and third weekend of October, Oct 11-20, 2013. Volunteers to greet guests and pass out voting ballots and festival programs are needed. In appreciation for volunteering we give free movie pass to each volunteer for each screening they help at. Everyone interested in volunteering at this year’s Seattle Polish Film Festival please contact Monika Johnson at monikajohnson@yahoo.com. All pierogi making sessions are at the Polish Cultural Center kitchen on Tuesdays from 7 pm to 9 pm. The Polish Parish in Seattle welcomes the new pastor. Fr. Andrzej Galant comes to St. Margaret's from Milwaukee, WI, where he served for 10 years as the pastor at the St. Maximilian Kolbe Parish which he helped to organize. Fr. Andrzej, 58, was born & educated in Poland and ordained in 1981. He is a member of the Society of Christ, a Polish order devoted to ministering to Polish diasporas all over the world. He came to America in 1996 and before Milwaukee worked in Toronto and Chicago. The Parish bid farewell to Fr. Stanislaw Michalek last Sunday. Fr. Stanislaw, who has served as the pastor at St. Margaret's since 2004 is moving to Minneapolis, MN, where he will minister at the Holy Cross Parish. We wish both Fr. Galant and Fr. Michalek successes at their parishes. At the Seattle Polish Festival in July, Polish Consul Malgorzata Cup decorated local Solidarity members in recognition of their activities and efforts that ultimately won freedom for Poland. Mr. Andrzej Mroz, the Solidarity leader at the Ziemowit Coal Mine received the Order of Polonia Restituta - the second highest Polish civilian order. 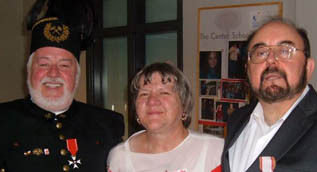 Solidarity activists Ms. Urszula Kubik and Mr. Stanislaw Kosciow each received the Cross of Freedom and Solidarity. All these decorations have been awarded by the President of Poland. Congratulations! The Polish Consul also honored local Polish community activists Mr. & Mrs. Marian & Barbara Strutynski with the Polish Angel consular award. Congratulations!